NOTE: The instructions to setup a StarlingX One Node Configuration (AIO-SX) system with containerized openstack services in this guide are under development. For approved instructions, see the One Node Configuration wiki page. Consolidate legacy applications that must run standalone on a server by using multiple virtual machines on a single physical server. Consolidate legacy applications that run on different operating systems or different distributions of operating systems by using multiple virtual machines on a single physical server. 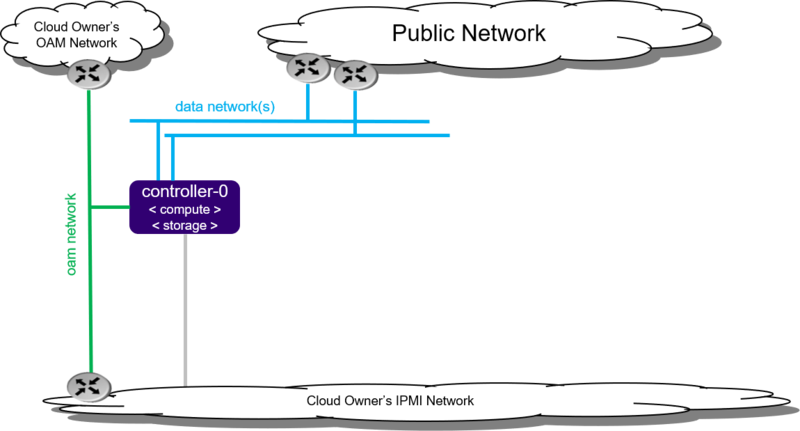 Only a small amount of cloud processing / storage power is required with an All-In-One Simplex deployment. An All-In-One Simplex deployment provides no protection against an overall server hardware fault. Protection against overall server hardware fault is either not required, or done at a higher level. Hardware component protection could be enabled if, for example, an HW RAID or 2x Port LAG is used in the deployment. NOTE: All-In-One Simplex configuration requires one or more data ports. This configuration does not require a management port. commands and unlock controller to proceed. Your StarlingX deployment is now up and running with one controller with Cinder storage and all OpenStack services up and running. You can now proceed with standard OpenStack APIs, CLIs and/or Horizon to load Glance images, configure Nova Flavors, configure Neutron networks and launch Nova virtual machines.